Marc MacLachlan netted four times as Lovat got their new Mowi Premiership season off to a flying start with 5-0 win at home to Kinlochshiel. Defending champions Newtonmore suffered an opening day defeat, 2-0 against newly-promoted Kilmallie at the Eilan. 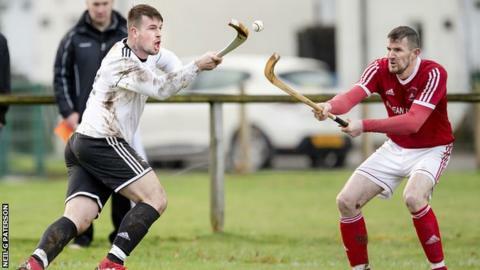 The only other senior shinty to survive was in the National Division with Fort William prevailing at Beauly and Glenurquhart beating Strathglass. Poor weather conditions forced four postponements and five abandonments. At Balgate, MacLachlan put the game beyond the reach of a depleted Shiel side with a first-half hat-trick. Greg Matheson got Lovat's fourth before MacLachlan got his own late on. The damage was also done in the first half at the Eilan where Kilmallie went ahead through Daniel Stewart on the half-hour and Liam Cameron scored just before the break. Newtonmore, who got off to a slow start before winning last season's title, were unable to respond to the 2018 National Division champions. Kingussie were already at Tighnabruich to play Kyles before the match was postponed, as was the case with Glasgow Mid Argyll on Skye in the National. The second tier featured a cliffhanger at Braeview. Home side Beauly struck early through Euan McCormick and Lewis Morrison equalised. Beauly's Jack MacDonald then traded goals with Jack Fraser before Alexander MacMillan gave the visitors a fleeting lead in advance of MacDonald's 3-3 equaliser right on half-time. In the second period, Fraser put Fort ahead again and Sean Stewart equalised before Morrison's winner two minutes later. Two goals from Ewan Brady and one from Andrew Corrigan gave Glenurquhart their comfortable opening victory over local rivals Strathglass.